Description: Double-headed Canadian Pacific Pacifics at the lagoon north of Riverside. Description: CPR 2317 and 1246 double-head a run-by freight at the lagoon north of riverside. Description: CPR 2317 and 1246 backing their train at the lagoon north of riverside. Description: CPR 2317 making a runby at Riverside with the photo freight. Description: 2317 and 1246 "double-up" on a freight at Riverside. 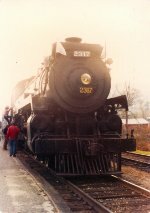 Description: CP 1246 works an excursion train next to CP 2317, which would achieve its fame several years later after Steamtown moved to Scranton. Description: CP 2317 was inactive at this time, but would go on to be a star at Scranton.